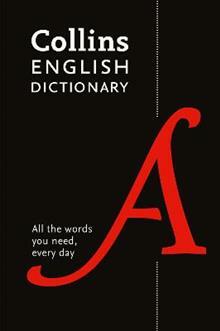 All the words you need, every day: the perfect dictionary reference for daily use, with all the words, phrases and definitions you need and fully up-to-date. Language usage notes help you choose the right word and the easy-to-use layout allows you to find what you're looking for ... read full description below. All the words you need, every day: the perfect dictionary reference for daily use, with all the words, phrases and definitions you need and fully up-to-date. Language usage notes help you choose the right word and the easy-to-use layout allows you to find what you're looking for quickly and easily. Specially tailored to meet your needs at home, school, and in the office, the Collins Paperback English Dictionary has comprehensive definitions and word tips to provide help with English usage. With this dictionary you can find all the words and definitions you need, as it boasts a comprehensive coverage of the language we use every day. It also contains the latest words to enter the language. The clear layout ensures you can find the words you need quickly. This edition contains an invaluable supplement on the most common mistakes and controversial issues in English. 200,000 words, meanings, and phrases Collins have been pioneers in dictionary publishing since 1819. We are proud to offer an extensive range of dictionaries in multiple formats and languages for all leisure, travel and educational needs.